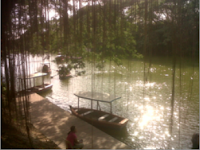 How To Get To La Mesa Eco Park? The La Mesa Ecopark in Quezon City is a well-developed sanctuary around the La Mesa Watershed via a joint partnership between MWSS, ABS-CBN, and Quezon City. The public park spans 33 hectares aims to preserve and protect the La Mesa Watershed, not only by generating revenues, but also promoting environmental awareness in saving the environment. Primary focus of the EcoPark is for outdoor recreation and forest experience. Students, families, environmentalist, tourist, fitness buffs flock the park everyday, seeing it as an alternative to the shopping malls in the metropolis. 1. Lopez Picnic Grounds - five hectares of picnic area under and surrounded by a forest of huge tall trees with grilling provisions. 11. Paintball field - Global Glutz is also in the house! 12. Wall climbing, rappelling, and zipline! *Key Note to remember: La Mesa EcoPark is located along Commonwealth Avenue. This is your main target road. You can access this via Quezon Avenue or North Avenue. Option 1. Ride a bus southbound via EDSA with signboards pointing to Baclaran, MIA, Alabang, FTI, or Ayala-Leveriza and get down at Quezon Avenue. 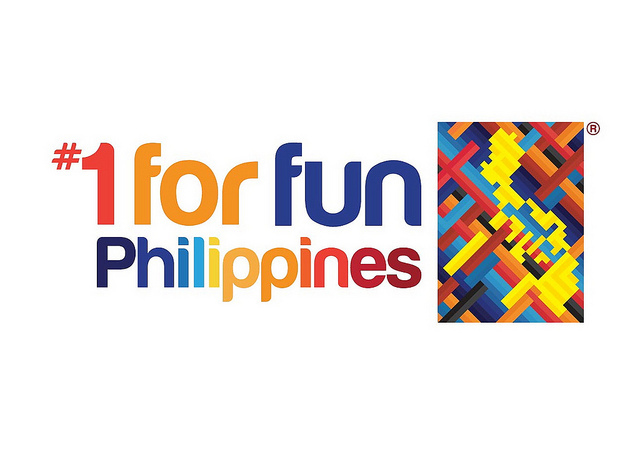 From there, ride an FX or jeepney bound for SM Fairview. These are very easy to find as they are plying through Quezon Avenue. Ask the driver to the drop you off Winston St. in East Fairview Subdivision. From there, ride a tricycle going to La Mesa Ecopark. Option 2.Ride an MRT southbound and get down at Quezon Avenue. From there, ride an FX or jeepney bound for SM Fairview. These are very easy to find as they are plying through Quezon Avenue. Ask the driver to the drop you off Winston St. in East Fairview Subdivision. From there, ride a tricycle going to La Mesa Ecopark. Option 1. Ride a bus northbound via EDSA to Fairview. Ask the conductor to the drop you off Winston St. in East Fairview Subdivision. From there, ride a tricycle going to La Mesa Ecopark. Option 2. Ride a bus northbound via EDSA with signboards pointing to Monumento and get down at Quezon Avenue. From there, ride an FX or jeepney bound for SM Fairview. These are very easy to find as they are plying through Quezon Avenue. Ask the driver to the drop you off Winston St. in East Fairview Subdivision. From there, ride a tricycle going to La Mesa Ecopark. Option 3. Ride an MRT northbound and get down at Quezon Avenue. From there, ride an FX or jeepney bound for SM Fairview. These are very easy to find as they are plying through Quezon Avenue. Ask the driver to the drop you off Winston St. in East Fairview Subdivision. From there, ride a tricycle going to La Mesa Ecopark. Option 4. There is an FX in SM Mall of Asia terminal that is bound for Fairview, you can ride that and ask the driver to drop you off Winston Street that is going to La Mesa Ecopark. From there, ride a tricycle to the park. This route might entail a longer travel time since you are circling Manila first before going to EDSA but the upside is you don't have to transfer vehicles. If you are coming from the Manila/Pasay area, you can also ride an LRT Line 1 to Doroteo Jose and transfer to the Purple Line via Recto Station and get down at Araneta-Cubao Station. From there, ride an MRT to Quezon Avenue and ride an FX or bus bound for Fairview and asked to be dropped at La Mesa Eco Park (Winston Street). Around Quezon City, you can ride a jeepney going to any point in QC Circle (for example, PhilCoa) and then ride a bus or FX bound for Fairview. Ask the driver to drop you off Winston St. to get to La Mesa EcoPark. For private vehicles, La Mesa EcoPark is along Commonwealth Avenue. You can access this road via EDSA passing through Quezon City Circle or via C-5 passing through Katipunan extension (going to Tandang Sora). Once you are in Commonwealth, the main landmarks are the following: if you are Fairview-Bound, you will see Sangkalan and City Oil gas station to your right and Honda showroom, PLDT/Skycable building on your left side. Turn right at Pearl Street, then right to Winston, and then left at Dunhill St.
Of course, you can ride a taxicab from any area in the Metro and ask the driver to bring you to "La Mesa Ecopark" along Commonwealth Avenue. View La Mesa Eco Park via Google Maps. *photo taken via Blackberry Curve. 76 Responses to "How To Get To La Mesa Eco Park?" Thank you for this detailed instructions on how to go to Eco park. Is La Mesa Eco Park tomorrow, April 7, 2012 (black saturday)? An immediate response will be highly appreciated as our family is excited to have a visit there. Thanks so much. Is La Mesa Eco Park open tomorrow, April 7, 2012 (black saturday)? An immediate response will be highly appreciated as our family is excited to have a visit there. Thanks so much. yes open po ang lamesa dam tomorow.accdg to one of their staff. Will La Mesa Eco Park be open tomorrow, April 8,2012 too? May 4, 2012 at 1:52 AM This comment has been removed by a blog administrator. how about from Holy Cross, Novaliches Quezon City? hi. 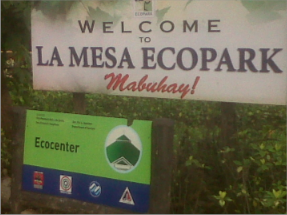 is la mesa ecopark open at dec. 25? thank you in advance. Is la mesa park open on Rizal day, December 30, 2012? thanks so much. how much entrance sa la mesa eco park? how much po ang entrance sa la mesa eco park bata at matanda? tnx po. hi po!open po ba lamesa tomorrow mar 28?tnx so much! Hello! is it open tomorrow? Black Saturday? If you're taking a Taxii going to La Mesa Park from Katipunan how long does it take and how much? Very helpful! Thanks a lot bro! 24 hours po bang open ang eco park?godbless!! Open po ba ang eco park? Mamaya po kasi pupunta kami ng asawa ko. Sana po open. Pupunta po kasi kami mamaya, promise. What tym does it closes? Pag 1st district ng caloocan mangaling, anu po puede sakyan papunta eco park? gusto po nmin mag family day dyan sa eco park saan po magandang venue? allowed po ba jan sa eco park ang mag-ihaw-ihaw? o magluto? Open po ba during Holyweek? April 1-2? My night swimmng po ba sa pool nla?hm entrance po ? Degrees, gems and far more free of charge of price. leoplaycard game is exceptional or secured. Most of the individuals. Open po ba ang eco park pag christmas? Is La Mesa Eco Park open on December 23, 2017?